B.C. 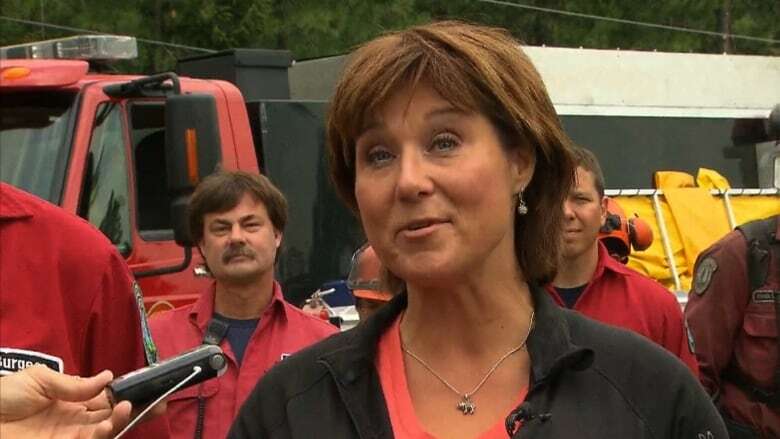 Premier Christy Clark says the effects of climate change will make wildfire seasons like the one the province is currently experiencing common. "Climate change has altered the terrain. It's made us much more vulnerable to fire," said Clark. "We have to be planning with the knowledge that this isn't going to be an unusual year." The premier made the remarks at the site of the Westside Road fire near West Kelowna after flying over the area to view the damage. There are 248 fires burning in B.C. Only 12 new fires started Tuesday, compared to 43 the previous day — and 100 on the hottest days. This afternoon an evacuation order for 80 properties near Bear Creek in West Kelowna was rescinded, with that fire (separate from the Westside Road fire) completely contained. Ryan Turcot of the BC Wildfire Service hopes that cooler, wetter weather predicted this weekend may help the situation for other evacuees. "More rain would be nice," he told CBC News. The parched conditions in the Interior are to blame for cost overruns, Clark says. The province has only budgeted $63 million for wildfires, which Clark said is based on a five- to six-year average. She said so far this year the province has spent $163 million fighting the fires and could spend as much as $400 million. Clark predicted the province will need more resources in coming years. "You never want to have to spend more money than you need to, but we're going to spend as much as needed to control these fires," she said. The premier said because of the province's $1.7-billion surplus this year, the extra expense should not put B.C. into deficit. Clark said the province is considering enacting harsher penalties for those who start wildfires. Almost 40 per cent of fires in B.C. in the past 10 years have been caused by people. "We've got to start thinking about stiffer penalties for people," said Clark. "People need to be thinking hard about their behaviour and the impact it can have." Some options may include impounding the cars of those who have flicked cigarettes out their windows. Clark said the province will consult with residents before implementing any changes. The Westside Road fire was started on Sunday afternoon by lightning, has quickly spread to 430 hectares and is not contained. It's of particular concern because it's threatening 70 nearby properties, which are under an evacuation order. No structures have been lost to the fire. RCMP officers are patrolling the area and 20 firefighters, along with five air tankers and two helicopters, are working to control the blaze. Kelsey Winter with the B.C. Wildfire Service said 1,400 homes are still without power because of the fire. The B.C. Ministry of Environment has issued an air quality advisory for the Okanagan region in the province's southern Interior because of smoke from nearby wildfires. The smoky skies advisory warns people in the area to avoid strenuous activities and to watch for adverse effects like difficulty breathing and chest pain. Infants, the elderly, and people with health conditions like lung and heart disease are particularly susceptible. Air-quality conditions are expected to vary as the winds and fire may change throughout the day.